The roar of a flying saucer shatters an otherwise peaceful day in the city! Gliding to a halt high above the city's skyscrapers, a small hatch on the underside of the saucer slides open and a tiny radio beacon begins to send a sinister new signal. Suddenly, hundreds of deactivated robots at the World Robot Exposition burst to life and begin destroying everything in mad rampage toward the center of the city! Watching the destruction unfold on his video monitor, Wily lets out a small laugh as he turns his attention to the robots who are now assembling in the city below. Scanning the thousands of robots awaiting his orders, Wily slammed his fists onto the control panel as he realizes one robot is free from the effects of his mind control device--Mega Man is free! --From the Gameboy Mega Man 4 instruction manual. 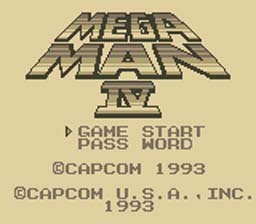 In Mega Man 4, our monochrome hero is at it again. Dr. Wily is back to his old tricks, and it is up to Mega Man to save the world. The graphics are quite good for a hand held, and the controls are very responsive. Any Mega Man fan will absolutely love this addition to the series. So climb on board, and give Mega Man 4 a try. Defeat all the robot masters, and collect weapons for your final face off with Dr. Wily. quite easy to get. Mega Man can also charge his Mega Buster for a big hit. Collect the letters B, E, A, and T.